A reader sends in a report of playing Chutes and Ladders with a 5-year old. Of particular interest is his observation of the difference between how we structure hundreds grids in classrooms and how the Chutes and Ladders board is structured (each, notice with a ten-by-ten grid). I had not thought about that before and now have something new to play with. Standard hundreds grid. Left-to-right, top-to-bottom. Chutes and ladders board. Snaking back-and-forth from bottom to top. Oh. Here is an important thing about Talking Math with Your Kids: When you notice differences like these, see them as opportunities to talk, ask questions, wonder and even to argue good-naturedly. It is not a problem that these grids are set up differently; it is an opportunity. Here is rjbrow‘s report. Enjoy. I try to play games whenever I can with my kids (ages 7, 5, and 2). Great practice with turn taking, understanding rules, making decisions etc. But like you mentioned here, games involving numbers provide a great opportunity to talk math with your kids. I’m glad you mentioned Chutes and Ladders here too. I had written this game off because in playing it with my two older boys, frustration would ensue by the abundance of chutes that would prolong the game and sabotage their progress. After reading through your Uncle Wiggly post, I played a game of Chutes and Ladders with my 5 year old yesterday and found a couple of really nice opportunities to talk numbers. First, each time he traveled a chute or a ladder, we had the conversation of which way to go on the new row. For example, he’d land on space 51 and travel the ladder up to space 67. So we’d talk about whether his guy should be traveling to the left or to the right. Jake figured out that if he was on space 67 he should be pointing his guy toward the 68 since it was bigger than 66. We’d also practice reading the numbers out loud. Like you mentioned, Jake can count to 100 but recognizing the written numbers is not necessarily the case. This was good practice. You also mention that learning to count can be messy. We have a write-on number grid at home that counts 1 to 100. 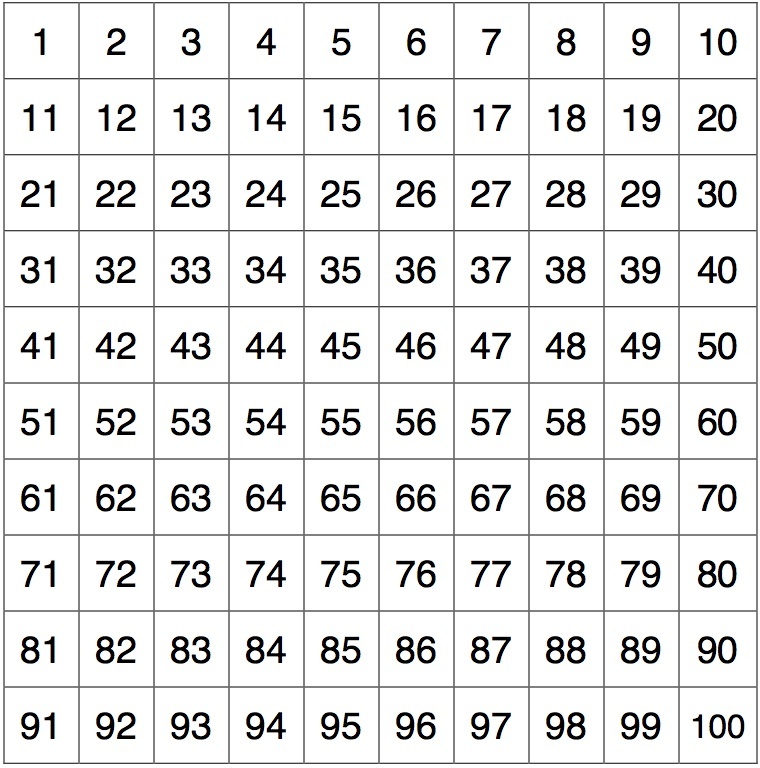 It’s really nice at looking at number patterns when you count by 2′s, 5′s, 10′s, etc. The numbers on this grid wrap to the next row so that all the like digits in the ones place line up vertically. Very nice. We’ve done some counting and pattern recognition using this grid. 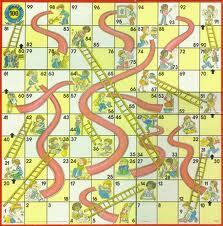 The difference with Chutes and Ladders is that the numbers wind back and forth on the way up the board. This was a shift to the counting we had done on the other grid. While this provided some nice conversation about how to work our way through this board, it did point out some messiness in how we present elementary number concepts to kids. Now who has a Chutes and Ladders board I can borrow to play with Tabitha and Griffin?